The Four of Disks. Power. Authority. Law. Order. Defense. Stubborness. Impenetrability. Blocked Change. Immobility. Display of Strength. Control. Possessiveness. The Four of Disks corresponds to the Sefirot of Chesed: Growth, condensation, stability, and matter. The Four of Disks is the spot where the energy of the Suit of Disks – having been given birth to in Binah – condenses and materializes into its first recognizable form – that of Power. The Works of Three have finally been created, and the result of this potential was the Four of Disks. This card represents what most people think of as “Earth” – Stubborness,Impenetrability, Defense, and Immobility. This card is extremely Solid, and is a good basis for Authority; it is extremely Ordered and can also represent the inflexible rule of the Law. This card also represents the Visible Strength of the Earth, and its inability to give in or yield. This card’s stable nature is reinforced by its association with the Sefirot corresponding to Stability; this card is the stable part of Earth, which is quite sturdy, immovable, and powerful indeed. The Rider-Waite art shows a man standing in the way of the reader, blockingthem. He also has his hands around one of the disks, holding it possessively. He stands atop two more disks, and doesn’t look like he’s going anywhere soon. 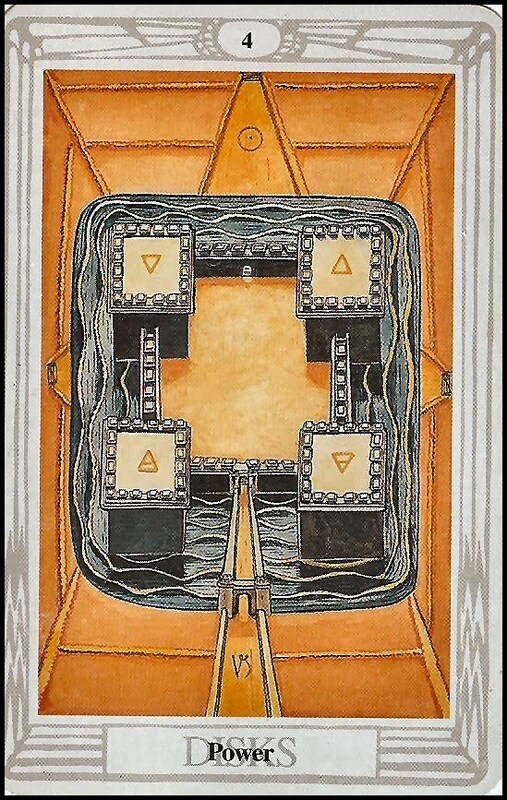 The Thoth art shows a fortress made of four square disks, with high walls and only one entrance. It is very well-defended, and is a symbol and visual Display of Strength, as well as an Impenetrable fortress and definitely an Immobile andImmovable object. It will stand its ground no matter what. In a reading, this card asks you to examine the role that stubborness, immobility, inflexibility, resistance to change, displays of strength, and ideas of possession and control play in your life. Have you been stubborn lately? Felt as if you were in control? Felt a need to show others how powerful you were? Reversed, this card’s energies are blocked or twisted somehow; the displays of strength might just be a facade, or perhaps you are not as immobile as you would believe yourself to be. Maybe, though, you have inner reserves to allow you to hold your ground that you didn’t know were there before.